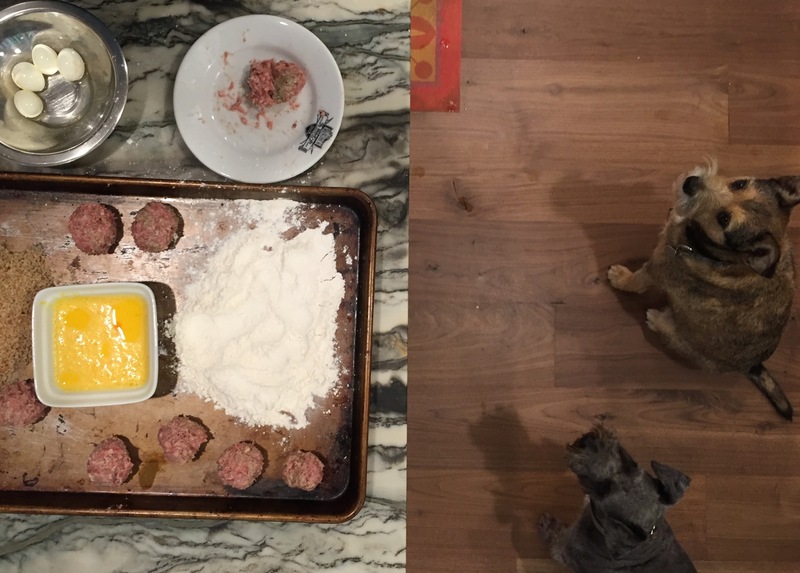 It all started with the quail eggs. 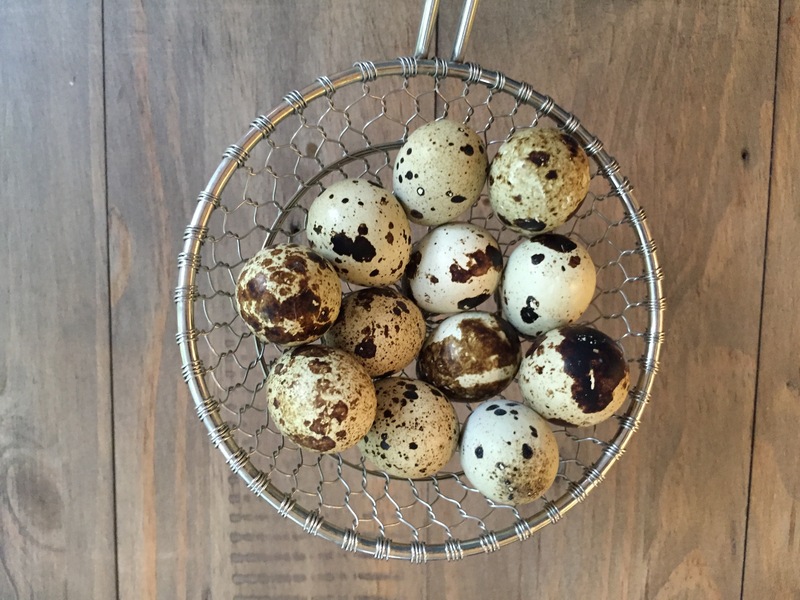 Will at Whitmore Farm is raising quail and every darn week those pretty speckled tiny eggs are there at the booth. Irresistable. I devilled a dozen a couple of weeks ago. The eggs are so tiny I snipped the top and removed the yolk with a demitasse spoon. By slicing across base, removing a small bit to make a flat surface, the egg sat upright. I filled them with a piping bag. Very pretty. Oops. No photo. 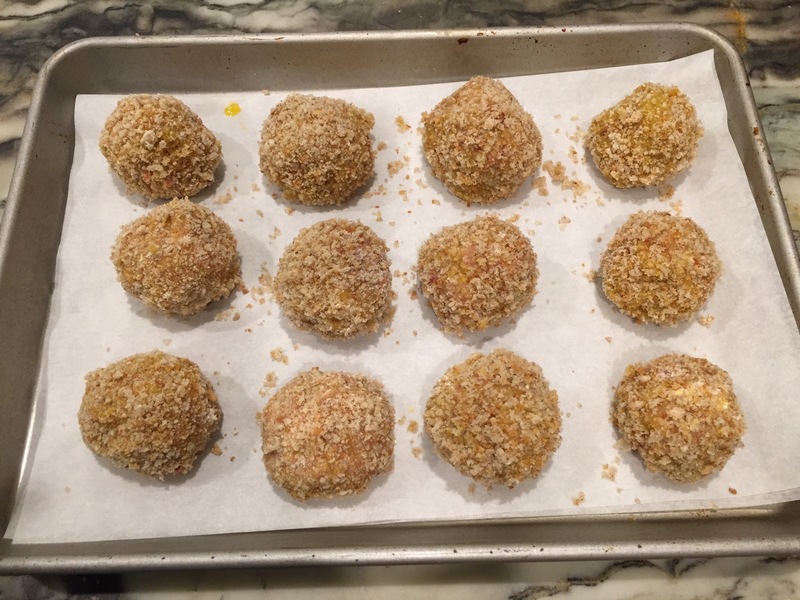 I am not sure where the idea of scotch eggs came from, but I couldn’t stop thinking about making small scotch eggs. 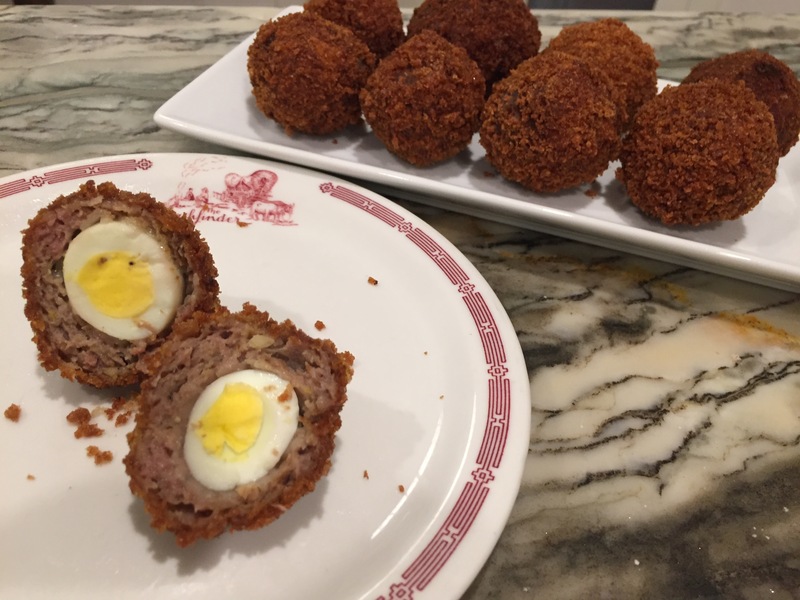 I love a good scotch egg, but have never been able to finish one. They’re just a little too big for me. But with a quail egg? I went foraging in the freezer for sausage to wrap the eggs. I usually have something stashed away. This time, I found Mary Reilly’s liver based, smooth textured pork sausage. I’ll admit I forgot I had it, so this was a particularly happy moment. Fill a medium bowl with cold water and a few ice cubes. Bring a small saucepan of water to a boil. 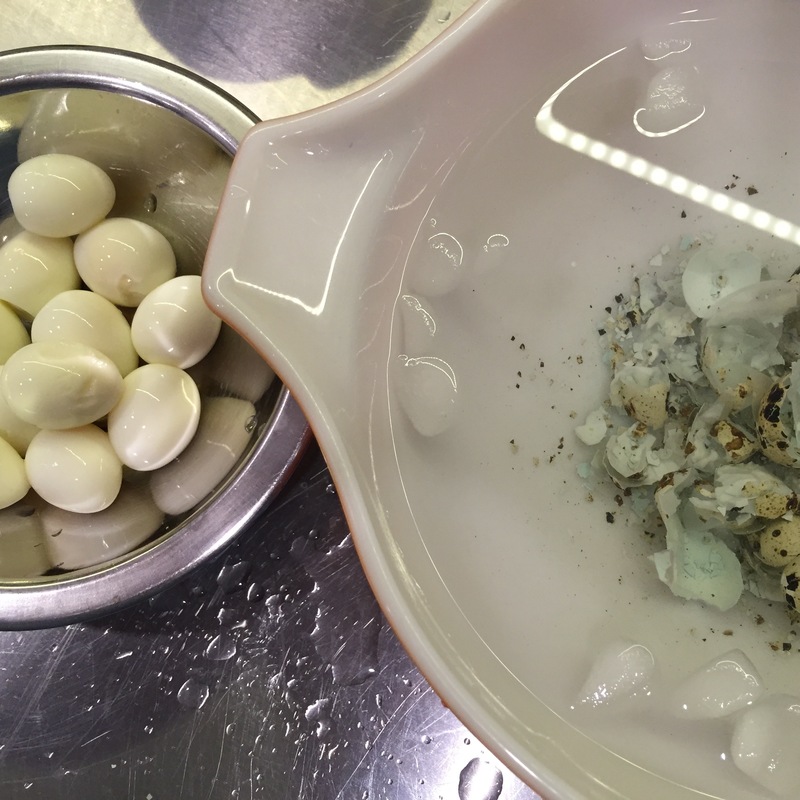 Immerse the quail eggs for precisely two minutes. Plunge them into the ice water. Peel the eggs under the cold, merciless water. Be gentle. They should be a little squishy. Rinse the peeled eggs and place in a small bowl. Chill them well before the next step. Set up a dredging station which I do on a baking sheet. One pile of flour on the left. A bowl with the beaten egg in the center, another pile of breadcrumbs on the right. Toss a big pinch of flour in with the breadcrumbs. Generously salt and pepper the flour, egg and breadcrumbs. Divide the sausage into 12 equal parts. Form oblong flat patties with the sausage, roll the egg in the flour, then wrap the egg with the sausage. Tuck, pat, pleat, form, gently squeeze until the egg is covered. Place the sausage covered eggs on the sheet pan as they are completed. Now dredge the eggs. 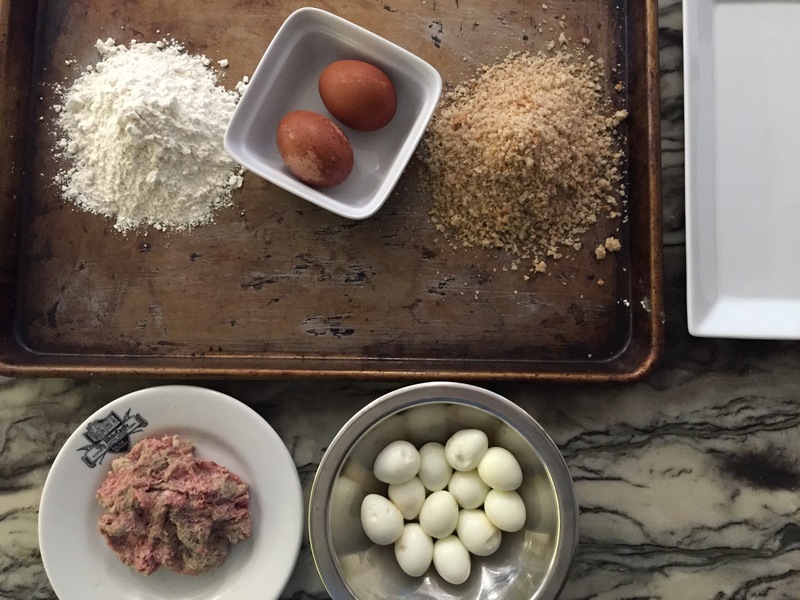 Roll the sausage in the flour, then dip in the egg, the roll in the breadcrumbs. If you want to be decadent and have an even crispier outer layer, dip in the egg and breadcrumb a second time. Chill the breaded eggs for at least an hour. Find a straight sided heavy duty pan. I used a one quart Le Creuset saucepan, ensuring the oil was deep even if I couldn’t fry them all at once. Heat the oil to 375°. Fry the eggs for 6 minutes. (Make one and cut it open to be sure it’s cooked through. Adjust the time, if need be. Drain on paper towels. Louie and Morty were pretty excited. Brilliant! Have to try a gluten-free version. Yes!!!! I also find full size Scotch eggs a little overwhelming. And they’re difficult to make trying to encase the egg in the sausage without gaps! This is genius and is going on my to-do list.